Josephine began her career as an environmental activist and educator with a focus on pollution in China. 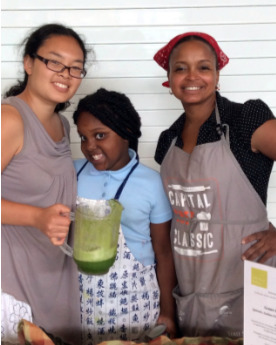 While working in a Chinese language immersion school in Washington D.C. she met Yolanda Hawthorne, a parent of a child at the school, and Yolanda was considering opening a juice bar and cafe. The two connected over a deep passion for a better food system and healthier communities and in 2012 Zenful Bites was born. Yolanda Hawthorne has been a passionate advocate for healthy food and communities since ____. First designing a ___ and then a ____ she has always been committed to ___.